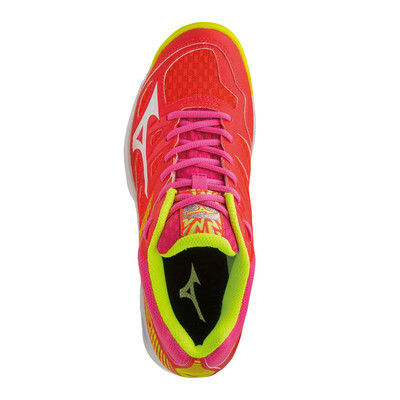 The Mizuno Wave midsole packs a punch, delivering on an incredibly stable shoe with endless grip. Premium lightweight materials give you unbelievable comfort and explosive results. "Great fit. The additional support is useful. Look good too!" 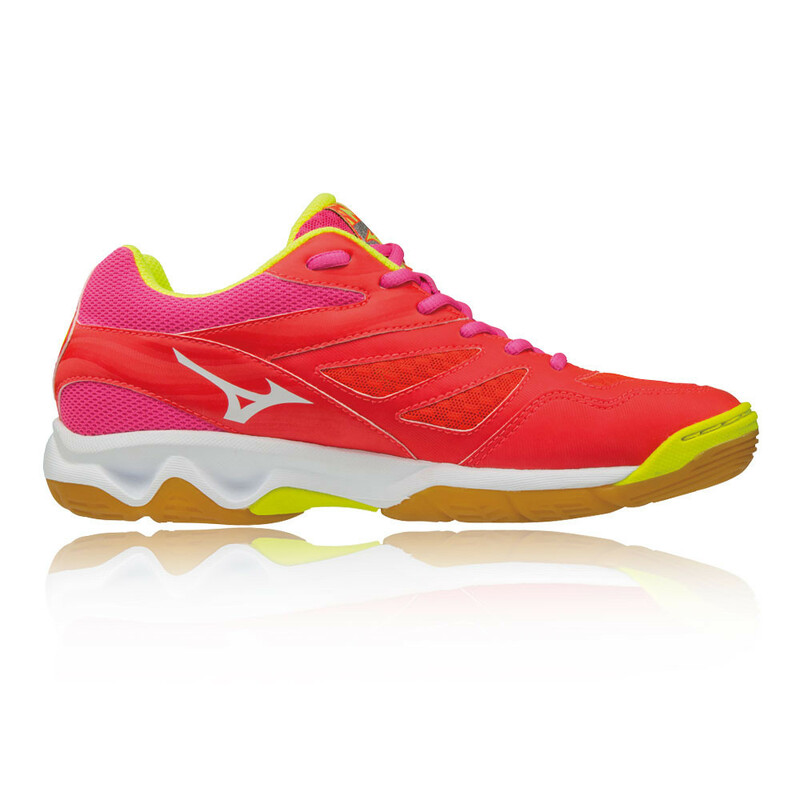 "Brilliant court shoe, ideal for netball. Very comfortable"
The upper of the Mizuno Thunder Blade is constructed using AirMesh that allows air to fully permeate the shoe, keeping a healthy flow of cool air keeping your feet nice and cool during intense activity. Overlays offer durability to the upper as well as working in tandem with the traditional lacing system to help provide a lockdown fit for the feet, cradling them which eliminates any slipping inside the shoes and any other distractions. A padded tongue and collar offer extra comfort where needed most on the top of the foot and also around the Achilles area. 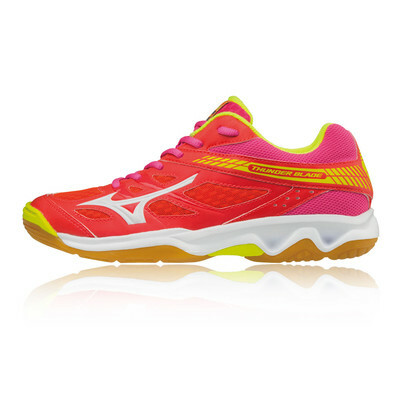 The Compressed EVA Midsole unit has been chosen for this shoe as it delivers stress-free cushioned rides, as well as offering the wearer a superbly comfortable running experience. The main purpose of the Compressed EVA is to provide you with protection from impact forces that can occur during running and prevent any injuries from ending the running experience shorter than expected. 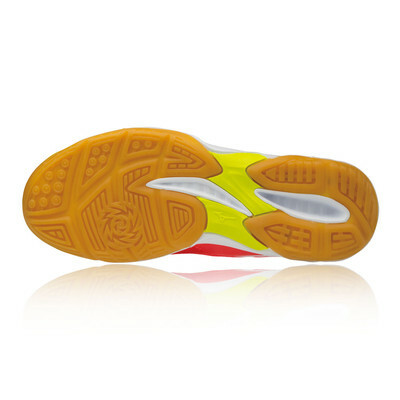 The non-marking rubber outsole provides superior traction on a variety of surfaces, best for indoor court sports these shoes provide the base for you to power off onto your next step and allow you to turn and swivel sharply which is a key part of the majority of competitive sports. Overlays - Provides a nice lock-down fit. Traditional Lacing System - Works together with the overlays to get a personalised and comfortable fit. Padded Tongue And Collar - Provide extra comfort where you need it the most. Compressed EVA Midsole - Provides amazing shock absorption and disperses impact forces. Non-Marking Outsole - Perfect for indoor court sports.